Arkady Dmitrievich Shvetsov created not only the first domestic air-cooled serial aircraft engine, but also a school of specialists capable of creating these engines. Arkady Dmitrievich was born on January 12 (24), 1892 in the village of the Nizhne-Serginsky plant of the Krasnoufimsky district of the Perm province, now the city of Lower Sergi of the Yekaterinburg region in a teacher's family. In 1908 he graduated from a real school in Perm and came to Moscow to receive a technical education. Like many who were interested in aviation at that time, A. D. Shvetsov entered the Moscow Technical Technical University, but he was forced to interrupt his studies, because he did not have the means to continue his studies. And only in 1921, he received an engineering degree. Since May 1922, Arkady Dmitrievich began work as head of the technical bureau of the Motor plant in Moscow. Largely thanks to his efforts, it was possible to organize the work in such a way that during the year 39 engines were released - much more than before. In the early twenties, he designed the radial M-11 air-cooled engine. The engine had five cylinders and a capacity of 100 liters. Since 1926, the first Soviet serial air-cooled engine was installed on more than 18 types of domestic passenger aircraft. For 40 years, it served as our training and light aircraft, and the Po-2 aircraft with this engine throughout the Great Patriotic War effectively performed night combat flights to bombing. Under the leadership of Shvetsov, Technical Director of the Motor Plant, a group of engineers developed the M-22 engine for the ANT-5 fighter. At the beginning of the thirties, the construction of a new engine-building plant in Perm began. When it was organized by the Bureau. At the same time, negotiations with the American company “Wright” about the purchase of a license for an aircraft air-cooled engine “Wright-cyclone”, which served as the prototype of the first Soviet serial M-25 engines, were completed. In 1934, Arkady Dmitrievich was appointed chief designer of the plant in the Urals. The plant was under construction and organization, and therefore the problem of personnel, especially at that time, was very acute. A.D. Shvetsov believed in his fellow citizens of the Urals and boldly set about organizing an experienced design bureau. At his disposal he had only a few young aviation engineers. But, helping them with advice and deed, he created the backbone of the bureau. Laxity or indiscipline were incompatible with the work in this bureau. In the spring of 1935, successful tests of the M-25 engine developed under the direction of A.D. Shvetsov passed. A powerful engine weighing only 435 kg was used on their fighters by DP Grigorovich and NN Polikarpov of the serial I-15. Developed in 1938 and manufactured in series, the more powerful M-63 engine was mastered very hard. In difficult conditions, Arkady Dmitrievich managed to show great perseverance, patience and calmness, which allowed him to successfully solve difficult problems. In the new engine of A. D. Shvetsov, instead of nine cylinders, it was fourteen, they were located in two rows. Launched into mass production in May 1941, the engine received the name ASH-82. It was designed for fighters and installed on the La-5 and La-7 aircraft - one of the best wartime aircraft. The use of less vulnerable air-cooled engines has contributed to the widespread use of these aircraft. 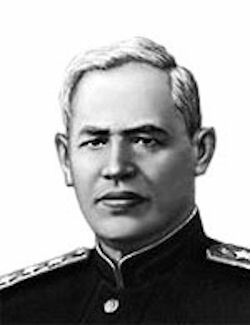 In 1940, Shvetsov received the degree of Doctor of Technical Sciences, in 1942 he was awarded the title Hero of Socialist Labor, in 1948 he was promoted to lieutenant general engineering and technical services. At the end of the war and in the first post-war years with the advent of jet engines, it would seem that piston engines are a thing of the past. However, it was at this time that Shvetsov introduced a turbocharger into the engine and ensured a flight at an altitude of 11 km. Its ASH-73TK had a power of 2400 horsepower, which reached the theoretical maximum power of this class of motors. This engine allowed the heavy Tu-4 bomber to be lifted into the air. Anticipating the need to create more high-altitude and heavier long-range bombers, the design team of A. D. Shvetsov at the end of the forties developed a series of experimental engines, including a unique ASh-2TK engine consisting of six blocks. The engine power reached 4300 liters. With., its high altitude and low specific fuel consumption was achieved due to the combined supercharging from the turbocharger and the drive centrifugal supercharger. The original in this engine was to use the energy of exhaust gases, which were discharged from the cylinders into gas turbines, which transferred additional power to the drive shaft, and the gas at the outlet of the turbocharger was used to obtain additional thrust. The ASH-2TK engine, like the engine of V. A. Dobrynin, was intended for heavy, high-altitude, ultra-long-range aircraft. During the period of use in both military and transport aircraft of piston aircraft engines, Arkady Dmitrievich Shvetsov was one of the eminent domestic designers who, in difficult times for the country, managed to organize a highly qualified team and, thanks to his talent and perseverance in solving the problems posed, he created a large number of types first-class air-cooled engines. Arkady Dmitrievich was organically inherent in honesty and self-esteem. A. D. Shvetsov highly appreciated these qualities in others. I must say that he was versatile talented. From his youthful years, having fallen in love with the Urals with its harsh, majestic nature and living on the banks of the Kama, Shvetsov wandered for hours on unequaled paths or floated by boat, observing the life of the forest, admiring the beauty of the Ural landscapes. Sometimes he took with him a frame and paint, the love of painting has been preserved from him until recent years. Arkady Dmitrievich was very fond of resting at chess. Even without a partner, he could spend hours dismantling complex tournament games. But his biggest hobby was music. Arkady Dmitrievich often said that he was ready to come to terms with any hardships, but he could not refuse the piano. At any hour, returning home. Arkady Dmitrievich died after an illness March 19, 1953.